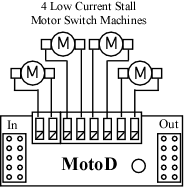 The MotoD is capable of driving four low current Tortoise™ motors for switch machine applications. One of the Team Digital SRC16 family members is required to control and provide voltage to the MotoD. Up to four MotoDs can be connected to a single SRC16. This means the SRC16 could control up to 16 Tortoise™ motor switch machines. The MotoD allows stall motors to be driven with a higher voltage than the 5 volts available from the SRC16 outputs. The MotoD output voltage is adjustable via only the SRC16 and SRC162. The MotoD can not drive the SwitchMaster, Scale Shops, Switch Tender, Tillig or Fulgurex motors. May drive the Cobalt but not recommended. Note: 1/22/15 the Cobalt iP Analog has a much lower current requirement and should work oK. This example diagram shows 4 MotoDs (two MotoD packages) connected to a SRC162e. Up to 16 Tortoise™. can be controlled.